There were 25 Judenrat members in all. "The members of the Jewish Council were, in general, recognized Jewish leaders, to whom the Nazis gave enormous power until the moment when they, too, were deported." The Council managed Jewish property and manpower, and drew up "transport lists" (lists of persons destined for extermination camps). A Jewish police force kept order, wearing as insignia caps of office, nightsticks, and special armbands with the inscription "Jüdischer Ordnungsdienst". There were around 50 of them. Gewisser stood at their head. There was also the Sanitätsdienst – the Sanitation Service. Its purpose was to maintain cleanliness in the apartments, courtyards, and streets of the Jewish quarters. After the closed ghetto was instituted, the functionaries of the Sanitation Service became part of the Health Division of the Jewish Council. In addition to their previous duties, its members were ordered to assign living quarters for Jews who moved to the already overcrowded ghetto. The Judenrat also had an employment office (Arbeitsamt), whose director was Izrael Friedman. The chairman of the Siedlce Judenrat was a man of already advanced age: Weintraub who was a worthy local social and political activist. For many years he had been at the head of the Zionist movement and the religious community. He kept a diary in which he recorded the important events of the town, as well as stories, told to him by Jewish elders. Unfortunately nearly all these writings have been destroyed. What has been saved is only that which he had published in the press in the interwar period. The function of chairman of the Judenrat was filled not by Weintraub EmilKarpinski remembers that: People fought each other, literally fought, gave bribes and used every possible means to get a position in the Judenrat or the Jewish Police. During the night of 24-25 December 1939, the Nazis set fire to the Siedlce synagogue on Pilsudkiego Street , murdering the homeless Jewish refugees who were sheltering inside. By December 1939, the Judenrat was already ordered to make a "contribution" of 20,000 zlotys. In 1940, from spring to winter, the Siedlce Jews were used for land reclamation work on the River Liwiec. Workers, divided into groups of 15, worked under Polish direction. The Germans had overall supervision of the labour, and the workers were supervised by SS-men, who controlled the progress of the work. Around 1,500 Jews left the ghetto every day and went to the jobs to which they had been assigned. In April 1940, the Germans carried out the registration of all Jewish men between 16 and 60 years of age, and in November 1940 a census of Jewish people was conducted for those streets on which they were most numerous. Within the Siedlce city limits, two quarters were marked off. Quarter I included the streets 1 Maja (now Swirskiego), Orzeszkowej, Kochanowskiego, StaryRynek (now Ul. Bohaterow Getta), Browarna, Jatkowa (now Czerwonego Krzyza), Targowa (now Czerwonego Krzyza), Aslanowicza, Blonie, and Pusta. It was inhabited by 3,589 Jews and 369 non-Jews, together 3,958 persons. Quarter II included the following streets: Sienkiewicza, Kilinskiego, Przejazd (now the extension of J. Kilinskiego), Asza, Kozia (no longer in existence), Poprzeczna (now Esperanto), Pulaskiego, and Przechodnia (now an extension of J. Kilinskiego). It contained 3,306 Jews and 372 non-Jews, together 3,678 persons. Together, according to the register, Quarters I and II were inhabited by 6,895 Jews. Quarters I and II formed the so-called "open ghetto". In November 1940, the Judenrat received a new order for a "contribution" of 100,000 zlotys. In December 1940 the number of Jews living in the town amounted to 13,000. During 1940, Jews from the Warthegau were forced to move to Siedlce, and from that year many Jews had to work in forced labour camps within the city. At the end of December 1940, the occupation authorities issued a decree requiring Jews to wear armbands with the Star of David and the inscription Jude. It was also decreed that Jewish shops must be marked. The Germans were also determined not to allow Jews, under the pressure of the existing situation, to change their faith. On 21 February 1941, the administrator of the Siedlce diocese, Bishop Czeslaw Sokolowski, issued a ruling to the Catholic clergy, in which he suspended permission for the baptism of Jews, Muslims, or pagans. He did so under pressure from the authorities of the Generalgouvernement, and in a decree of 23 January 1941, in order to prevent the numerous conversions from Judaism to Catholicism, the Germans decided that it would be the competent Starosta or Mayor who would make the decision. The Bishop’s ruling, however, was not too carefully observed, as the Generalgouvernement authorities addressed themselves again to the Diocesal Curia in Siedlce in this matter. In a document of 10 October 1942 they required that "adults be checked at baptism, to find out if they are of Aryan descent." For a certain time contact remained between craftsmen in the ghetto, mainly shoemakers and their business partners on the Aryan side. The latter placed orders with the craftsmen and provided food in payment. The transfer point was a stretch of Sadowa Street. On receiving word of this from an informant, the Germans sealed off the ghetto. In November, Jews from the following localities were moved to Siedlce: Czuryly, Domanice, Krzeslin, Niwiski, Skorzec, Skupie, Stara Wies, Wisniew, Wodynie, Zbuczyn,Suchozebry, and Zeliszew. In March 1942, 12,417 Jews lived within the ghetto precincts. In the winter of 1941/42 a typhus epidemic broke out. It was the result of the terrible conditions prevailing in the ghetto. A large number of people were crowded into a not very large area and the sanitary conditions worsened as the streets of the ghetto did not possess sewers. As Mojzesz Halbersztadt remembered: All contacts between the Polish and Jewish populations were cut off, which resulted in a sudden worsening of provisioning. The only item that could be acquired without difficulty was the Jewish Gazette, published in KrakowIn December 1941, the occupiers required the Judenrat to provide them with all the furs in the possession of Jews. Persecution continued all the time. 1942 was greeted with great apprehension. The local cabalists feared it because the year contained the same numerals as the year 1492, the year in which the Jews were driven out of Spain. On 3 March 1942, the Germans seized 10 Jews and shot them at Stok Lacki under the pretext that they had refused to work. Under German pressure, the Judenrat issued a declaration supporting the sentence. In June 1942, Nazis required the Jewish Council to provide a certain number of craftsmen and their machines. At the beginning, the place to which they had been sent was kept secret. Later it turned out that it was the concentration camp at Lublin. (Majdanek). On 23 May 1942, the Gypsies (Roma) who lived in the county began to be moved into the ghetto. They were given until 15 June 1942 to move and were required to wear on their right arm a white band with the letter "Z" in lilac. A part of the Gypsy population that had been deported to Platerow and Sarnaki from 10 - 31 December 1940, had stopped in Siedlce and the surrounding area. These were transports of over 500 people, who had come from the lands annexed to the Reich. In the course of 1941, the German Gypsies (Sinti and Roma) of Köln (Cologne) and its environs, including Hürth, were transferred to Siedlce. There were at least 326 Gypsies in the ghetto. Self-defence groups began to form on the basis of acquaintance, or of school, social, family, or political contacts, both within the ghetto and without. In the middle of 1940, the Polish Armed Organisation, whose composition included members of PSL (Polish Peoples Party, called ludowcy) issued a statement in which it was written, amongst other things, that: Wherever necessary, in as far as possible help should be given to members of the Jewish nation. The form of help should be dictated by needs on the one hand, and by possibilities on the other, with the aim of making it possible to survive the common danger and common enslavement. Let us remember that after the destruction of the Jewish people, the unpredictable occupiers will commence the complete liquidation of Poles. In July 1942, the governor of the Warsaw District, Dr.Ludwig Fischer, conducted an inspection in Siedlce and met with a representative of the Jewish community in front of the main gate to the ghetto. In his speech he expressed his satisfaction that the Jewish population were effectively contributing towards an increased German war effort. He also spoke of opening workshops in which the Jews would find employment. This meeting gave great comfort to the Jews.It was a false hope Dr.Fischer deliberately wanted to calm the Siedlce Jewish community. The Aktion Reinhardt, mass murder programme was already underway. Information about the liquidation of ghettos in other cities and about the transfer of people to the area of Malkinia had already reached the ghetto. On 20 August 1942, the inhabitants of the ghetto received a serious warning. The Germans demanded the immediate provision of several dozen workers for the purpose of unloading railway cars. After the cars were opened it was discovered that inside were the bodies of Jewish men, women, and children, who had come from Radom. The railway car was part of a "death train" that transported Jews to Treblinka. As a result of a fire the car could not reach its destination. When the workers opened the car they saw around 100 dead bodies – squeezed together and intertwined one with the other. They had all died from lack of air, from the heat, and from the fumes of the quicklime with which the floor of the car was strewn. Under the rifle butts of the SS-men, the workers had to empty the car. The dead were taken to the Jewish cemetery where they were buried. The Germans spread the news that the dead were prisoners being moved to another prison, but no-one believed it. On Saturday 22 August 1942, in the early hours of the morning, the ghetto was surrounded by the Germans, the Polish blue police and by Ukrainians. Machine guns were set up on the two sides of the main entrance to the ghetto. That day 9,300 Jews from Mordy,Losice, and Sarnaki arrived in Siedlce. The local Jews were told that by 10 o’clock all must report to the cemetery by the burned main synagogue. In addition to the police mentioned earlier, the Jewish police also took part in supervising the execution of this order. The search for those in hiding now began. There were not many of them, since, as Hercel Kave remembers, It required both courage and the will to live. However, apathy was understandable. People who had lived for three years without hope, humiliated, were now psychologically exhausted and without any desire for life. Some, particularly those discovered by the Ukrainians, were killed on the spot. The others were led to the Umschlagplatz, which was located on Ulica Berka Joselewicza. On Sunday 23 August 1942, around 10,000 Jews were loaded into railway cars and sent to the nearby extermination camp of Treblinka. FlorianskaStreet, through which the columns walked to the railway station, was covered in corpses. From a hiding place, a Home Army photographer took several photographs of the walking column in order to document the extermination of the Siedlce Jews. These photos are in the possession of the Regional Museum in Siedlce. Photographs have have also been preserved of the loading of the people into cars, made by a Wehrmacht soldier, Hubert Pfoch, who was passing through Siedlce on his way to the Eastern front. Pfoch recorded what he had seen in his diary, and these have been covered in a separate article. The entire time the search continued for those in hiding. On 24 August 1942 the staff and patients of the Jewish hospital on 1 Maja Street (now the Emergency Care building on Swirskiego Street), around 100 people in all, were killed. All the patients were shot in their beds; over a dozen new-born children were also murdered. The hospital staff – the doctors, nurses, and orderlies – were shot in the hospital courtyard. Dr Loebel was killed with this group. Miraculously, R. Landau escaped, extricating herself from under the pile of bodies after the massacre and the departure of the Germans. Two days later, on 26 August 1942, 29 women who had previously worked at sorting the clothes of the victims were shot at the cemetery. Estera Spektor managed to escape from their temporary prison on the night before the execution. 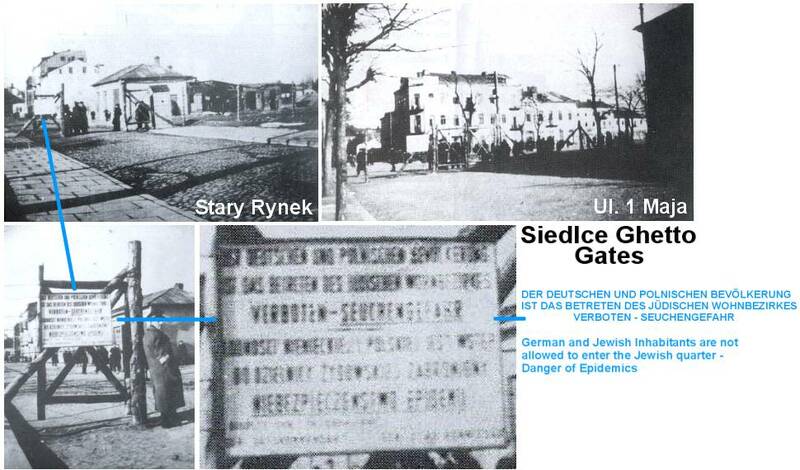 After the liquidation of the ghetto, on 27 August 1942, the Nazis made the following announcement: "As a result of the deportation of the Jews, there are empty apartments and job openings in the towns of Siedlce, Losice, and Mordy. Hard working and ambitious people, particularly artisans, now have the opportunity to set themselves up for life in the above mentioned towns." The liquidation of the Siedlce Ghetto was appended to the report of the United Underground Organizations of the Warsaw Ghetto to the Polish government-in-exile in London, and the Allied governments on 15 November 1942. The report was transmitted to the Polish government-in-exile by the courier JanKarski. After the liquidation, the so-called 'cleansing' - the search for hidden Jews began. Thus in the bakery on Targowa Street, belonging to Jankiel Piekarz, a Sonderdienst patrol under the command of the Volksdeutsche Backenstoss, discovered a group of thirty people. Piekarz's entire family was hidden there with several of his neighbours. They had been sitting there for five days. After finding the hiding place, Backenstoss opened fire with his machine gun, killing all of them on the spot. Amongst those killed was Haskiel Trzebucki and his fiancé Franka Piekarz and the family of Jankiel Dekiel. In the attic of a house on Aslanowicza Street the Lewin family was discovered. They were led to the cemetery and shot. By some miracle Kuba survived. His mother, mortally wounded, covered him with her body, as she fell. Kuba lay there for several hours , and in the early morning escaped from the cemetery. With the help of friends he hid and obtained false papers. On the grounds of the Jewish bath-house 50 people were discovered and killed. In the offices of the Judenrat 20 people, including the family of Efaim Celnik. During the 'cleansing' period around 200 people were discovered and murdered, including Przezdziecki and Goldblat. The corpses were collected by groups of Jews, who pulled a two-wheeled cart, they called an 'arba.' They pulled it to the gates of the ghetto and loaded the corpses onto a wagon pulled by horses, and driven by Poles. It was the Poles who transported the corpses to the Jewish cemetery. From the people chosen to survive, numbering around 600 people, the so-called 'little ghetto,' called Drojek, was established. It was located in the triangle formed by the streets Sokolowska, Aslanowicza and II Listopada. These inhabitants were used for 'clean-up' work following the liquidation of the ghetto. In the following days, after being assured of their personal safety by the German authorities, approximately 1,500 Jews appeared, who had survived the liquidation by hiding. A new Judenrat was formed with Hersz Ajzenberg, at its head, and two members Mosze Rotbajn, Director of the Employment Office and Anatol Goldberg, who was Provisions Director. A health clinic was opened, headed by Balfor, the sole Jewish doctor to have survived the liquidation. A Jewish Police force was also formed, which took care of individual houses, and acted as guards and kept order. Its commanding officer was Rubenstein, and after him Abraham Gessler. The number of those people squashed into the 'little ghetto' is estimated between 1,500 and 3,000. Included in this figure were not only the Jews of Siedlce itself, but also escapees from other small towns, who had been wandering in the Siedlce environs as well as Gypsies. Conditions in the ghetto were terrible; there was a lack of water. Some of those who settled in the 'little ghetto' collected the remnants of the victims property, which they sorted. The 'better' things were sent to the Reich, for those affected by the bombing raids, the remainder was sold to the local Polish population. The functioning of the 'Jewish Residential Quarter' was confirmed by an edict by the F.W. Kruger, the head of the SS and Police in the Generalgouvernement. The first order the German authorities directed to the newly formed Judenrat was to pay the fire department for pouring water on the Jews during the deportation The 'little ghetto' was guarded by a small force, two Jewish policemen and Polish 'Blue' policeman. The ghetto received a daily ration of bread, amounting to 250g per person. Also allowed into the ghetto were candles, matches, coffee and camomile. There was a group of Hassidic Jews in the ghetto; the followers of Tzaddik of Radzyn. They differed from the rest of the inhabitants not only in their traditional clothing, but also by their behaviour. They helped each other, and they considered safeguarding their collection of holy books, in which no-one else was interested, as their most important task. They helped believers to celebrate Rosh Hashanah (the New Year) and Yom Kippur (Day of Atonement). The Hassidim formed an 'island amongst a sea of inhuman behaviour,' where it was considered normal to strip a corpse of everything that might be useful. Over a dozen children were in hiding, illegally on the terrain of the ghetto, which had earlier been occupied by Gypsies. After three days, on 28 November 1942, the Nazis liquidated the ghetto. During the night they surrounded the area. The following morning they chased the people out of their homes, placed them in rows of five people and drove them to the railway station, where the wagons were already waiting for them. A number of those marching prepared themselves for death, by donning prayer garments and adopting a resigned frame of mind. At the head of the procession marched Icchak Nachum Weintraub. People already knew what awaited them. In many wagons, people began with great energy to break the windows, as soon as the train moved out. The well-known master locksmith Symcha Wilk, had brought his tools with him. When the train was in full movement Wilk, using his tools, was able to open his wagon, and a large number of Jews jumped out. Many also escaped from the wagon which held the Jewish Police. However, a large number of the escapees were shot on the spot, or caught. This camp was named after the German owner, Richard Reckmann. The camp was established in January 1941 and was liquidated in March 1943. It was located in the fire-station and two barracks by the railway tracks. The camp occupied approximately 5 square kilometres. On average around 500 people were living there at any one time. In all, approximately 15,000 Jews passed through the camp. The prisoners worked for the Reckmann firm, building railway lines working in the railway workshops and at construction sites. An epidemic of typhus and scarlet fever raged in the camp. There was a health clinic. For brutal hard work the prisoners received 200g of bread, half a litre of black coffee, and 1 litre of soup, consisting of chestnut flour, brukiew (very poor quality vegetables, used as cattle fodder), or beets. The Nazis shot many Jews and many died as a result of being beaten. There were even instances of workers being buried alive at construction sites. The seriously ill, who could no longer work, were returned to the ghetto. Camp III – German Building Inspectorate No. 8 "Kiesgrube"
This camp was established in 1941 and liquidated on 14 May 1943. It was located behind the Siedlce-Lukow railway line, by the Lukow road. It occupied a territory of around 2 square kilometres. On average around 300 people, who were housed in two wooden barracks and in railway wagons, were living there. The prisoners worked in gravel quarries, where the norm was the loading of around 150-200 wagons with sand a day. Food was 250 g of bread and 1 litre of soup. The director of the camp was Inspector Hoppe. There were cases of death by beating or during the loading work. During the liquidation of the camp some of the prisoners died in buildings that the Germans set on fire; the remainder were shot in the Jewish cemetery. Only Leon Kaplan survived. This camp was established in 1941, and liquidated in October 1942. It was located on Brzeska Street. On average around 2,000 people were imprisoned there. The prisoners lived in 10 wooden barracks. The director was a certain Volksdeutscher named Wasilewski. In all around 20,000 Jews passed through the camp. The prisoners were engaged in road construction work for the Wolfer and Göbel firm, including work on the Brzesc and Siedlce to Warsaw roads and railway lines. This firm was working within the framework of the Organisation Todt. There was an epidemic of scarlet fever in the camp. During the liquidation of the camp the prisoners were moved to the little ghetto. This camp was located by the railway station. Around 100 prisoners lived in the camp, residing in railway cars. These prisoners worked repairing railway tracks on the Siedlce to Brzesc line. The director of the "Bauzug" was Walter, a railway man from Wuppertal. This camp was located in barracks by the railway houses. It functioned from 1942 to 14 May 1943. 60 people, who were engaged in unloading building material, lived in it. The director of the camp was a German by the name of Schefner. In addition to the camps mentioned above, a Jewish crew of around 30 persons worked on the grounds of the so-called "Agriculture Syndicate", around 60 worked in the Gesi Borek glass works, and around 100 at the army airport located in "New Siedlce". The number of Jews who passed through the Jewish work camps should not be linked solely with the local Jews. Jews from the city’s environs, from little towns and villages, as well those moved to Siedlce from other places, also found themselves in the work camps. In total 17,000 Jews died in the town or were transported to Treblinka. They came not only from Siedlce, but also from the ghettos in the Losice area (from Losice, Huszlewo, Olszanka, and Swiniarow), the Sarnaki area (from Sarnaki, Gorki, Kornica, Lysow), and the Mordy area (from Mordy, Krzesko-Krolow Niwa, Przesmyk, Stok Ruski, and Tarkow). Only a small number managed to hide, but they were in constant danger. The Siedlce dentist, Stanislaw Gilgun, who was hiding in Warsaw, perished during the Warsaw Uprising. Antoni and StanislawGórka were discovered and tortured to death in a Gestapo prison. In 1943 the Germans tried to cover the traces of their crimes in Siedlce. With the help of a 40 person group of Jews from Bialystok they disinterred the bodies of the murdered and burned them in piles. For several days the stench of burning bodies hung over the town. After the driving of the Germans from the town, a number of Jews who had survived returned to their homes. Within the territory of the Siedlce powiat there were barely 200 of them. The departing Jews went first to Lodz and then later left for Israel or other countries. After 1968 the children of those who had escaped extermination also left. W. Sobczak, Cmentarz ..., s. 4; Dokumenty i materiały do dziej´w okupacji niemieckiej w Polsce, t.2 ; Akcje i "wysiedlenie", cz. I, opr. dr Józef Kernisz.